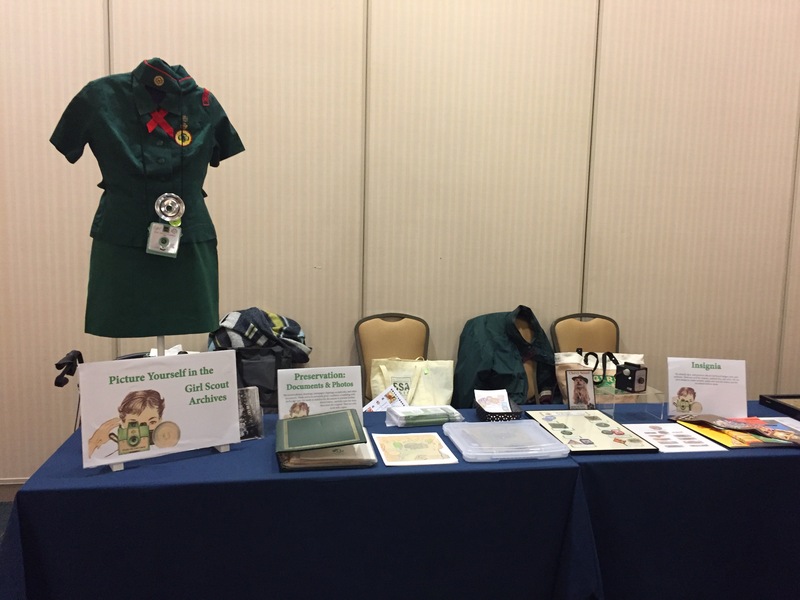 Last Saturday was the Nation’s Capital 2018 Annual Meeting, and the Archives and History Committee arranged an exhibit. 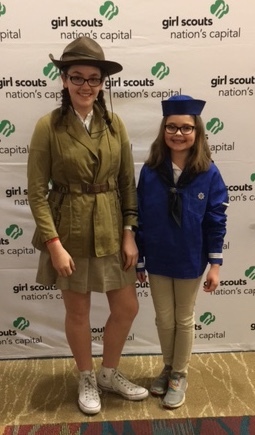 The exhibit theme was “Picture Yourself in the Girl Scout Archives,” and it had two parts. First, Committee members brought a current project to share. 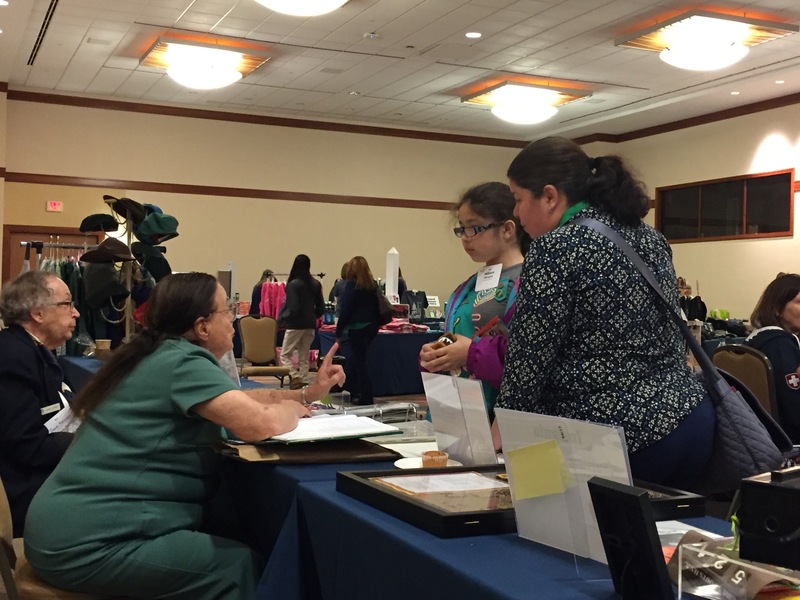 We are informally divided by specialty (uniforms, patch programs, books, publications, etc.) and this seemed a good way to demonstrate what the Committee does. I brought some of our camera collection to decorate our display, and many girls were fascinated by them. We had to explain that these cameras did not have phones. Second, we organized a photo booth with old uniforms. Last year we had a large exhibit of adult uniforms and people were literally lining up to have their picture made with the mannequins. We decided to build on that by having uniform pieces to try on. Hats were easy to arrange. We’d been advised by other history groups to be vigilant about hygiene since we didn’t want to accidentally spread germs or unwelcome critters. We lined each hat with a basket-style coffee filter that we changed after each wearing. Uniforms were more challenging. Folks today are larger than people a few decades ago and some of our uniforms are tiny! We know that for fashion shows, we have to go for younger models. Sometimes only a Daisy in kindergarten can fit into a vintage Brownie dress, and we have to use a fifth-grade Junior for one of the vintage teen uniforms. But we’d gotten a fabulous idea from other historians: split uniforms. 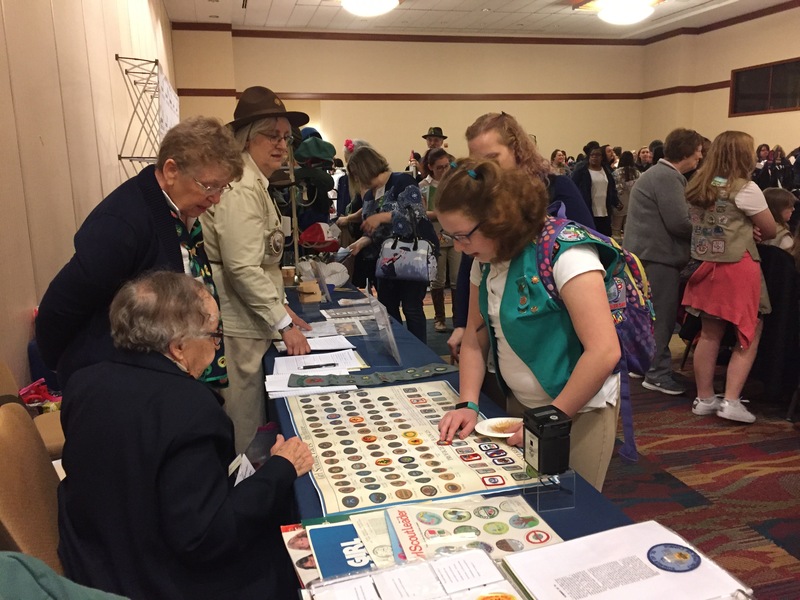 I saw them up close at the North Carolina Girl Scout Collector’s Show in March, and organizer Becky Byrnes offered some great advice. Uniforms are split along the spine, hemmed, and ribbons or bias tape is sewn in to use as ties. Girls and adults slip the old uniform on over their clothing, much like a doctor slipping into a surgical gown. It doesn’t completely solve the size issue (tiny uniform + clothing = tight squeeze) but everyone seemed pleased with the results. Our designated photographer reported snapping pictures of 74 groups, and many more visitors took selfies. This experiment worked well and we plan to have more split uniforms available at our Program Centers. I have a busy week coming up, first going to the North Carolina Girl Scout Collectors’ Show, then on to Savannah, Georgia, to see my daughter, who is a junior at the Savannah College of Art and Design (SCAD). She is busy studying schedules and determining what classes to take this fall and the rest of her senior year. I continue to be amazed at the variety of courses and career paths offered at SCAD. They have areas of study that I never knew existed, like yacht design, sequential art, and luxury and fashion management. SCAD takes a very hands-on, applied approach to learning that equips students for creative careers. I already have another trip to Savannah penciled in for October, this time for a Girl Scout history conference. The last such conference I attended was very conceptual–discussions and presentations on the changing role of museums in the 21st century. Accessory and Jewelry Design: Techniques for cleaning pins and metal camping equipment; novel ideas for displays of lots of tiny objects. 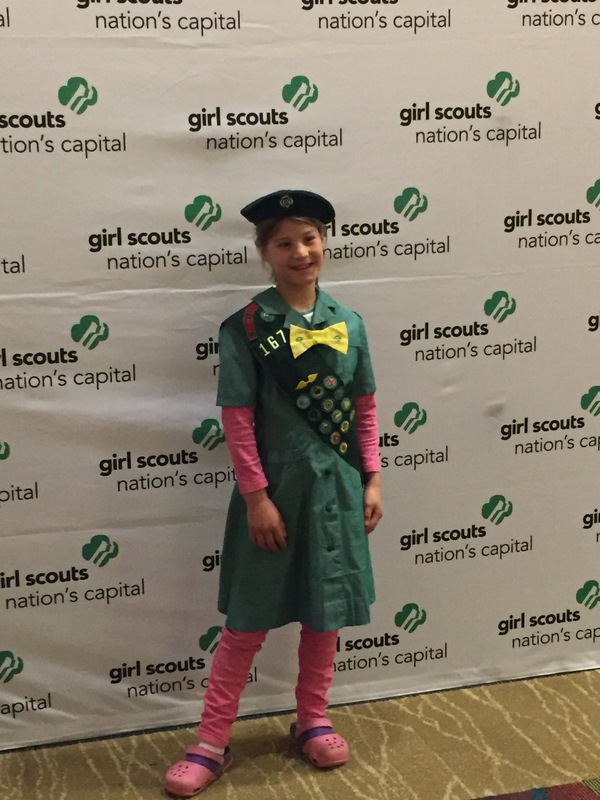 Acting and Character Development: For our living Juliette Gordon Lows. Branded Entertainment: I don’t have any idea what this is, but how often do we hear about communicating and protecting the Girl Scout brand? Maybe we would learn! Fashion/Fibers/Costume Design: Best techniques for preserving old fabric; how do you clean 100-year old sweat stains and rust stains? Museum Studies students craft narratives about their artifacts (SCAD). Preservation Design: This also seems obvious. Designing exhibit displays and props (SCAD). Production Design: Tips on how to construct and configure exhibits and display spaces. Conducting a two-hour workshop on these topics would be a great experience for students, as SCAD teaches them to hone their presentation skills whenever possible. I definitely would sign up for as many as possible. Ultimately, the conference curriculum isn’t up to me. Maybe I’ll just browse the textbook aisle in the campus bookstore and try to learn some of these skills on my own. 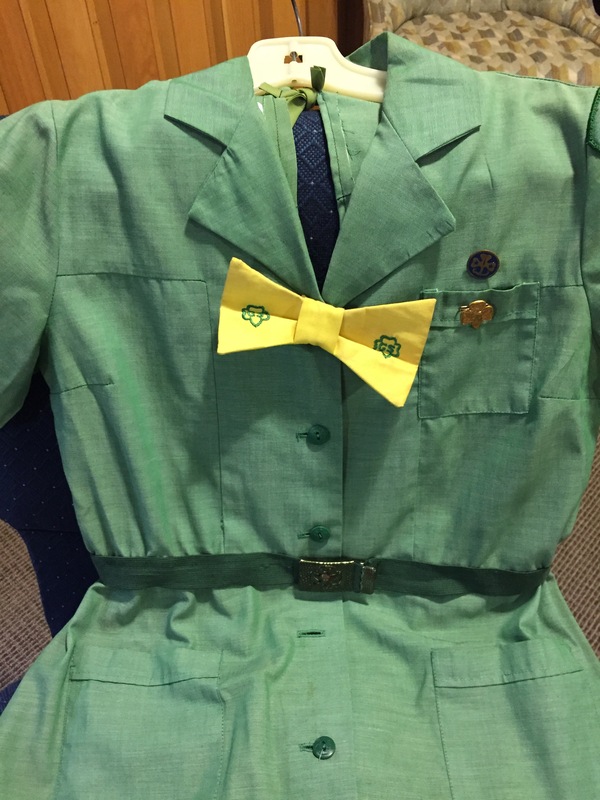 I knew it would be fun to share Minnie Hill’s uniform with everyone. Writing that post became even more exciting as I discovered details about her life. What I didn’t expect, was how many readers would join the search for more about Minnie. Readers jumped into Ancestry.com, Newspapers.com, and more. Different facts were posted on different platforms, so I’ll gather them together here. First, readers asked about the uniform’s provenance. They came from the family of Janet McIntyre of Chevy Chase, Maryland. 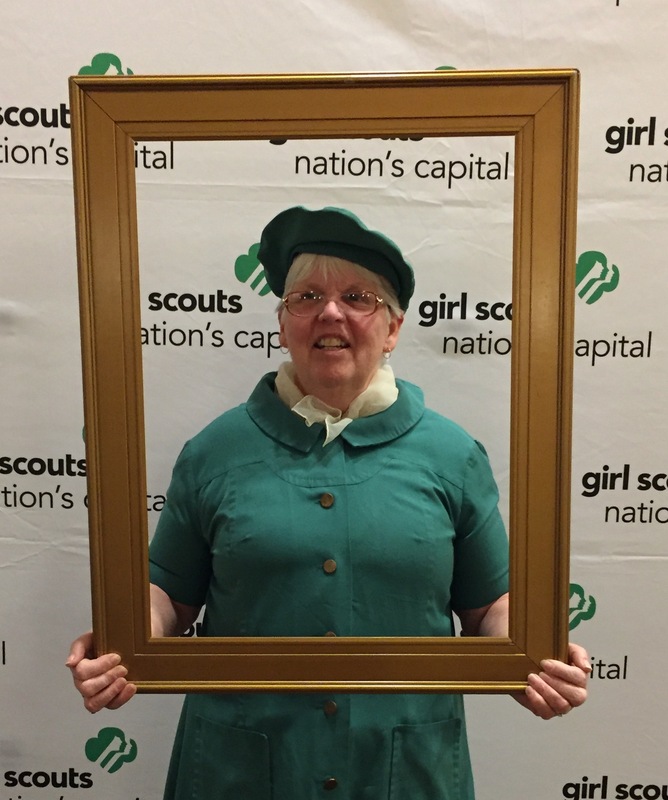 Janet had been an active Girl Scout leader beginning in the 1950s. Like many leaders, she accumulated many, many, GS materials over the years, and troops could borrow items, such as these vintage uniforms, for meetings and ceremonies. Janet passed away in June 2015 (age 94). 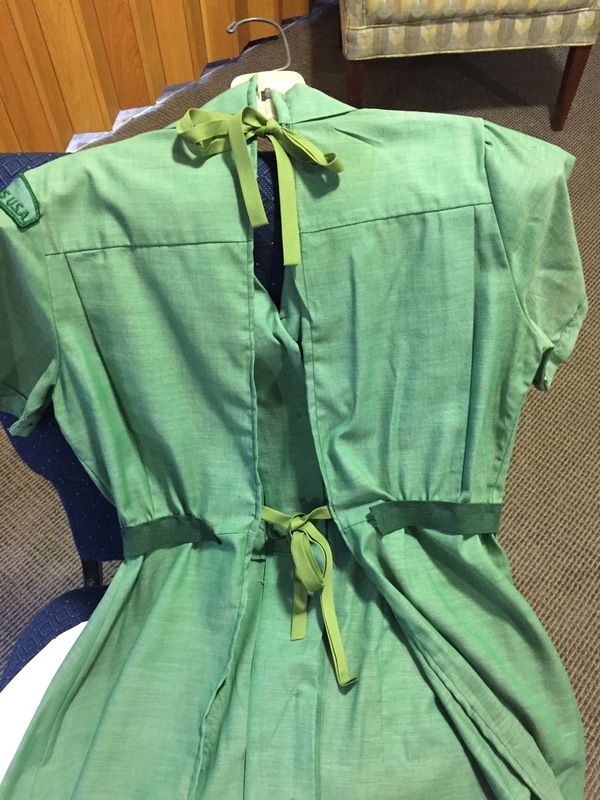 Her children discovered the uniforms as they prepared to sell the house and contacted the council to inquire about donating. They aren’t sure where or when their mother acquired this uniform–one of many. Minnie Mosher Hill was born September 30, 1903, and died August 25, 1988. She never married and lived first with her mother, and later with a sister, Eleanor. After attending college, she initially worked as a secretary in a Washington law firm. She then spent 20 years working at the Alexander Graham Bell Association for the Deaf. Her obituary shows Minnie’s interest in history and genealogy. She was an active member of the Colonial Dames Society, serving as regional chairman and on the national board. Several readers fired up PhotoShop to try to digitally repair our one confirmed image. Not only is the original torn, it is partly stuck to a plastic cover, which makes it difficult to get a clear image to work with. The brownish version is from Mel Squiers, the reddish one from Merena Cadorette. But the prize for the best contribution goes to Stan Myles, from my own Service Unit. Several people had suggested looking for Minnie in old copies of the Central High School yearbook, but I haven’t had time to go to the DC Public School Archives. This photo will have to do. Thank you to everyone who helped tell Minnie’s story!! Minnie is buried in Washington’s Rock Creek Cemetery. Wednesday began as an ordinary work day at the Nation’s Capital Archives and History Program Center in Frederick, Maryland. We focused on one of the vintage suitcases that came with the collection. (Even the suitcases are in pristine shape.) There were about a dozen bags to go through. First, we found the tiniest khaki uniform I’ve ever seen. Skirt, jacket, even the bloomers were included. It appears home-made. Then I heard someone yell, “Look at the badges!” One sleeve of the uniform was covered with an impressive, colorful record of hard work. Yes, those are seven White Felt badges–the rarest of rare Girl Scout badges, available only from 1913 to 1918. The seven new White Felts bring our total number to — 10! 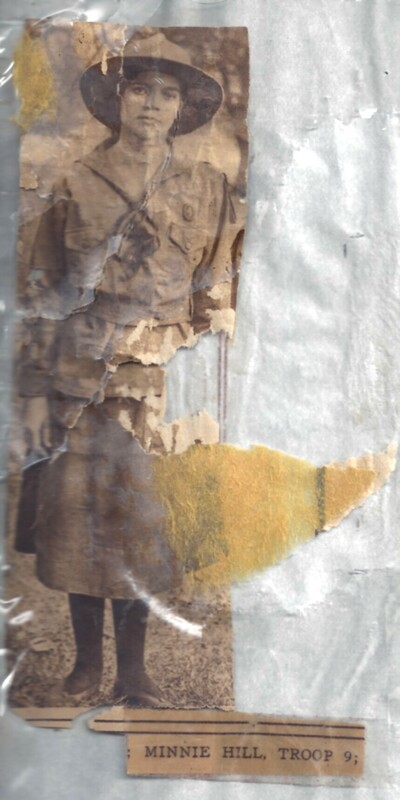 According to a tattered paper in the suitcase, the uniform belonged to Minnie Hill. Of course, this called for more research. The included paper had three typed paragraphs, two faded newspaper clippings, and one ripped photo. They reported that Minnie Hill attended Central High School in Washington, DC, and was a Girl Scout in Troop 9 from 1917 to 1919. She received her First Class badge from Mrs. Woodrow Wilson at a White House ceremony 100 years ago — on June 21, 1917. Two years later she was back at the White House, this time to receive her Golden Eaglet from Queen Elizabeth of Belgium on October 31, 1919. The Queen, her husband, and their son were touring the United States at the time, and her participation in the ceremony had a special significance for Minnie, as Troop 9 had practiced their sewing and knitting skills by making layette sets for newborns in Belgium. A Washington Times article about the 1919 ceremony noted that Minnie had earned 19 badges; all of which are still on her uniform sleeve. In between those awards, Minnie was recognized for selling Liberty Bonds during World War I. The Washington Post reported that she had sold eleven war bonds for a total of $900. In addition to a medal, high sellers usually were honored with a parade. Alas, the 1918 parade was canceled due to the Spanish flu outbreak. I searched the electronic archives of three different Washington newspapers, but did not find the photo. Then I had another idea. That ceremony in 1917 was well documented. 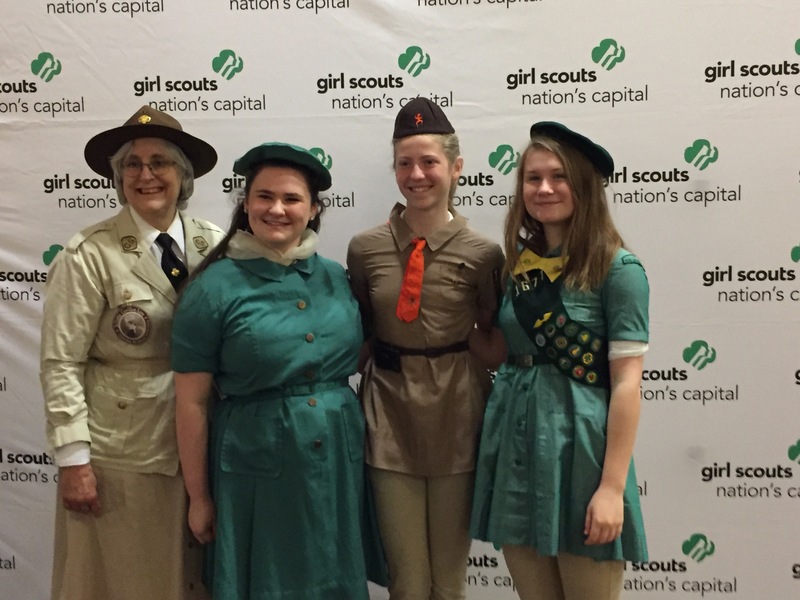 In fact, it was the ceremony where two Washington scouts, Eleanor Putzki and Ruth Colman received their Golden Eagles of Merit. Could Minnie be in one of those photos? Take a closer look at the young lady on the back row, far left. I think that is Minnie Hill. History hasn’t lost her after all.